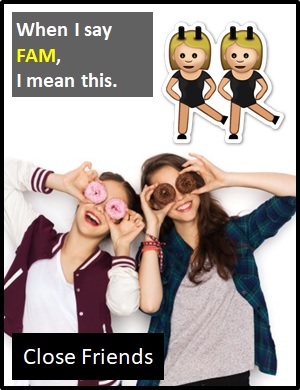 FAM | What Does FAM Mean? FAM means "Close Friend" or "Hungry". The abbreviation FAM is a contraction of the words "Family" and "Famished". "Close Friend". Although FAM is short for "Family", it is normally used to refer to friends who are so close that they are considered family, rather than to actual biological relatives. In this context, FAM typically refers to best friends. These people are your chosen family, people that you trust completely. The popularity of the term FAM with the meaning "Close Friend" is credited to American rap group Dipset. They used the term in their 2003 hit "This Is What I Do". "Hungry". FAM is also often used as a contraction of the word "Famished" (i.e., to be very hungry). You can call your best friend "FAM". Person B: I'm doing well, FAM. Person B: What's up, dog? FAM is a contraction of family or famished. Some contractions, like FAM, use the opening letters of the fully expanded words. Other contractions, like Dr, use letters from the start and end of the word. Contractions can also be formed by replacing a letter or letters with an apostrophe (e.g., can't, won't).